Duchenne muscular dystrophy (DMD) and Becker muscular dystrophy are caused by mutations in the dystrophin-encoding DMD gene. Large deletions and duplications are most common, but small mutations have been found as well. Having a correct diagnosis is important for family planning and providing proper care to patients according to published guidelines. With mutation-specific therapies under development for DMD, a correct diagnosis is now also important for assessing whether patients are eligible for treatments. This review discusses different mutations causing DMD, diagnostic techniques available for making a genetic diagnosis for children suspected of DMD and the importance of having a specific genetic diagnosis in the context of emerging genetic therapies for DMD. Schematic depiction of dystrophin transcripts in healthy, Duchenne muscular dystrophy (DMD) and Becker muscular dystrophy (BMD) individuals. (A) In the normal situation, the dystrophin mRNA consists of 79 exons that are translated into the dystrophin protein. (B) In patients with DMD, protein translation is stopped prematurely. This can be due to frame-shifting mutations (in this example, a deletion of exons 47–50, top panel) that lead to the inclusion of aberrant amino acids and generally premature truncation of translation. Alternatively, a point mutation can change an amino acid codon into a stop codon (bottom panel, nonsense mutation). This premature stop codon will be used instead of the natural stop codon at the end of the transcript. (C) In patients with BMD, mutations maintain the open reading frame (in this example, a deletion of exons 46–54). As such, protein translation does not stop prematurely but continues until the natural stop codon at the end of the mRNA. However, the generated dystrophin will be shorter because it will lack the amino acids encoded by exons 46–54. By contrast, individuals with BMD generally have mutations that maintain the open reading frame, allowing the production of dystrophin proteins with an internal deletion or duplication that can connect actin to the connective tissue, and thus are partially functional (figure 1C). Consequently, individuals with BMD often show a later onset and a slower disease progression, although there is phenotypic variation, with some patients being diagnosed in childhood and others being diagnosed in midlife or later.5 ,6 Almost all DMD patients will develop cardiomyopathy,7 and there is a high risk patients with BMD will develop cardiomyopathy regardless of the skeletal muscle phenotype. The incidence of dystrophinopathies is ∼1 in 4000 (1 in 5000 for DMD and 1 in 20 000 for BMD in male live births).5 ,8–10 Since the DMD gene is located on the X-chromosome, DMD and BMD present primarily in males and are maternally inherited. Correct DNA diagnostic analysis is crucial for DMD and BMD patients since it is important for optimal care and family planning, but also provides information on eligibility for mutation-specific treatments.11 In this review, we will explain the different types of mutations that have been reported for the DMD gene, discuss genotype–phenotype correlations; outline the genetic diagnosis of children suspected of having DMD; and discuss the importance of a specific genetic diagnosis in the context of emerging genetic therapies. A glossary of terminology is provided in table 1. The DMD gene is the largest known human gene, containing 79 exons spanning 2.2 Mb.5 The mutation rate is relatively high; in one in three cases, DMD is caused by a de novo mutation. As such, new cases will arise even with good prenatal diagnostic tools and family counselling for known cases. 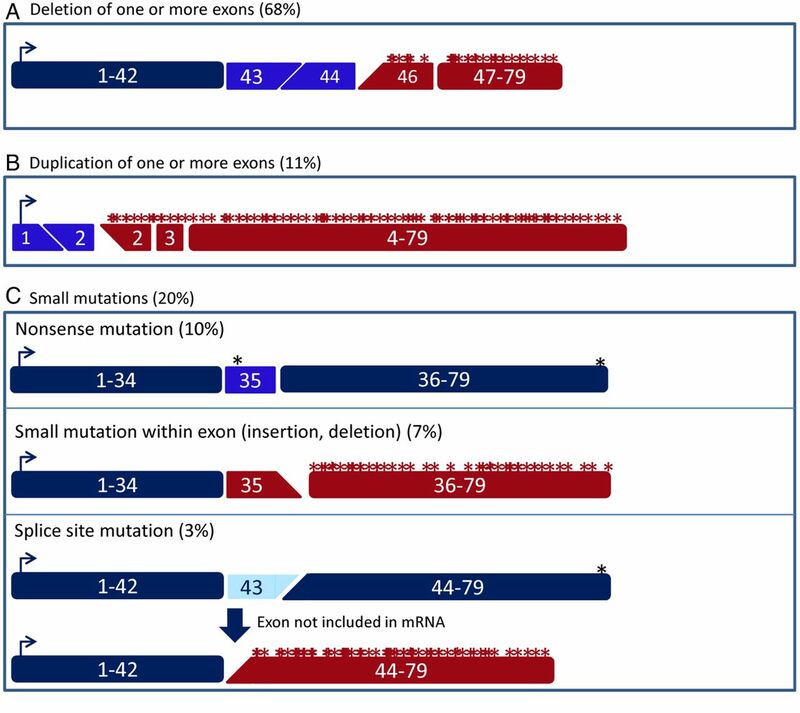 This high mutation rate also underlies the large variation of mutations that has been identified for patients with DMD (figure 2).6 ,12 Although the majority of patients have a deletion (∼68%) or duplication (∼11%) of one or more exons, small mutations are found as well (∼20% of patients). These deletions and duplications can occur anywhere in the gene, but are concentrated between exons 45–55 and exons 2–10 for deletions and duplications, respectively.13 The outcome of deletion and duplication mutations can be twofold. If the number of nucleotides in the exons that are deleted or duplicated is divisible by 3, the reading frame will not be disrupted. This will allow translation of the mRNA into a dystrophin protein that, although slightly shorter or longer in the centre, contains the N-terminal and C-terminal domains crucial for connecting the actin cytoskeleton to the extracellular matrix. These dystrophins retain some degree of function and are found in patients with BMD. By contrast, when the number of nucleotides of the exons deleted or duplicated is not divisible by 3, the reading frame is shifted, leading to the incorporation of aberrant amino acids into the protein during translation. Often, an incorrect reading frame contains many stop codons, leading to premature termination of translation and production of a truncated protein. The resulting dystrophins lack the crucial domain that connects to the extracellular matrix and are therefore not functional and generally not stable. These mutations are associated with DMD. Schematic depiction of the effect of different types of Duchenne muscular dystrophy (DMD)-causing mutations on the dystrophin transcript. (A) Deletions of one or more exons can cause a shift of the open reading frame (in this example, a deletion of exon 45). (B) A duplication of one or more exons can cause a shift of the open reading frame (in this example, a duplication of exon 2). (C) There are several types of small mutations than can cause DMD. Nonsense mutations (top panel) introduce a stop codon prematurely (in this example, the nonsense mutation is located in exon 35). Small insertions or deletions (middle panel) can disrupt the open reading frame (in this example, a 1 bp insertion in exon 35). Finally, mutations affecting the splice sites (bottom panel) generally lead to the exclusion of the affected exon from the mRNA (in this example, exon 43). As such, a single-exon deletion that disrupts the open reading frame is generated on the mRNA level. There are several ways by which small mutations can interfere with dystrophin production (figure 2C). Small deletions or insertions can disrupt the reading frame at an exon level, which like larger out-of-frame deletions or duplications involving one or more exons leads to non-functional dystrophins. Point mutations can convert a codon for an amino acid into a stop codon, which will also result in premature termination of protein translation. Finally, point mutations or small deletions and/or insertions can disrupt a splice site. During the splicing process, introns are removed by the splicing machinery, for which recognition of the splice donor (first two nucleotides of an intron (GU)) and splice acceptor (last two nucleotides of an intron (AG)) is crucial. Generally, an exon for which the acceptor or donor splice site is mutated will no longer be recognised by the splicing machinery, leading to the exon being excluded from the mRNA. Thus, splice-site mutations generally cause a single-exon deletion at the mRNA level, which will lead to a partially functional or a non-functional dystrophin depending on whether the omitted exon was in-frame or out-of-frame, respectively. In <1% of patients, other types of mutations are found; for example, deep intronic mutations can lead to an intronic region being recognised as an exon by the splicing machinery (cryptic or pseudo-exons) leading to its inclusion in the mRNA.6 ,12 Cryptic exons can disrupt the reading frame and/or will contain stop codons preventing the production of functional dystrophin. Missense mutations are rare in patients with DMD, and the few that have been reported are located in the cysteine-rich domain of dystrophin and abolish the binding to β-dystroglycan, which in turn connects to the extracellular matrix.12 ,14 Therefore, in effect these missense mutations are similar to other DMD-causing mutations because they also disrupt the connection between actin cytoskeleton and extracellular matrix. Finally, a handful of cases caused by translocations involving the DMD gene have also been reported. These mutations separate one portion of the gene from the other, preventing a full transcript being produced. Notably, translocation mutations involving the DMD gene will cause a DMD phenotype in females.15 ,16 Normally, carrier females will be born with 50% of dystrophin positive muscle fibres due to random X-inactivation of the chromosomes carrying the mutated or the normal DMD gene. With translocation mutations, however, cells where the translocated DMD gene is inactivated will not survive due to a lower dosage of the autosome involved in the translocation. Thus, the unaffected DMD gene will always be inactivated and no dystrophin can be produced. For in-frame mutations, the location and size of mutations can influence disease severity to some extent.6 ,28 In-frame mutations that abolish the extracellular matrix-interacting domain (encoded by exons 64–70) or all actin binding domains (encoded by exons 2–10 and exons 32–45) will not result in functional proteins and are therefore associated with DMD. In-frame deletions affecting the first 10 exons delete the first two actin binding domains, but spare the third one encoded by exons 32–45, typically leading to a ‘severe BMD’ phenotype. Deletions in the hotspot region (exons 45–55) are generally associated with a milder disease presentation. Deletions between exons 10 and 40 are milder still and are sometimes only associated with cramps and myalgia and are sometimes found in asymptomatic individuals.29 Finally, X-linked dilated cardiomyopathy patients have mutations in the DMD gene, but present only with a cardiac phenotype in the absence of skeletal muscle problems.5 ,30 Here, dystrophin is produced in skeletal muscle, while it is not produced or not functional in heart. While most carriers do not present with symptoms, some ‘symptomatic carriers’ present with cramps, myalgia or even progressive muscle weakness.31 ,32 Notably, female carriers are prone to develop dilated cardiomyopathy as well. Physicians should suspect DMD when young boys present with impaired muscle function, frequent falls and Gower's sign.11 ,33 Delayed speech is also frequently observed in young boys with DMD, probably due to the absence of a brain isoform of dystrophin. Serum analysis will reveal the presence of elevated muscle enzymes due to leakage into the bloodstream (most notably creatine kinase (CK), but also transaminases such as aspartate transaminase and alanine transaminase). Upon these findings (delayed muscle function, speech delay and high CK), patients are generally referred to neuromuscular specialists, who request genetic analysis of the DMD gene to confirm whether the patient has DMD (figure 3). Overview of suggested stepwise mutation analysis when suspecting Duchenne muscular dystrophy (DMD). When reporting mutations, it is important to use standard nomenclature as described on the website of the Human Genome Variation Society (http://www.hgvs.org/mutnomen/). Furthermore, it is important to include patients in national patient registries (upon consent), so they can be contacted when mutation-specific therapies are tested in clinical trials or become available on the market. The majority of mutations will be detected by multiplex ligation-dependent probe amplification (MLPA) or exon sequencing on DNA level. If no mutation is found, a muscle biopsy can be taken to study dystrophin protein. When dystrophin is abnormal or absent in a muscle biopsy, while no mutation can be found with MLPA or exon sequencing, one can consider analysing muscle RNA to identify the potential inclusion of a cryptic exon due to an intronic mutation (these will not be identified with MLPA or exon sequencing). Given that deletions and duplications of one or more exons are found in the majority (70%) of patients, it is most cost-efficient and labour-efficient to check for these mutations first (see table 2 for the costs of DMD diagnosis in selected European countries). The multiplex ligation-dependent probe amplification (MLPA) analysis is the most reliable test to identify exactly which exons are involved in deletions or duplications.34 This approach uses sets of probes that can hybridise to each of the DMD exons. Each set of probes consists of two oligonucleotides that hybridise adjacent to each other to a given exon. Probes have a tail to allow PCR amplification and one of the probes contains a ‘stuffer sequence’, the length of which differs for each pair of probes. Upon hybridisation, a ligation step joins the two probes and a PCR will be performed, which can only amplify ligated probes (ie, probes that were able to hybridise). The resulting PCR fragments are then run for fragment analysis, where each exon is represented by a fragment of a defined length (which varies due to the stuffer sequence). This approach will reveal whether or not a given exon is present and allows the copy number of each exon to be calculated by comparing relative peak heights. MLPA can detect both deletions and duplications in patients and carriers. Small mutations within an exon can prevent binding of the probe to that exon, and as such, these mutations can present as single-exon deletions using the MLPA method.35 Therefore, a PCR using intronic primers is generally used to assess whether the exon is deleted or contains a small mutation. Furthermore, while MLPA detects which exons are involved in the deletion or duplication, it is not informative about the location of the intronic breakpoints. Alternatively, array comparative genome hybridisation (array CGH) uses probes covering dystrophin exons but also introns conjugated to a glass slide.36 Control and patient DNA is fragmented and labelled with separate fluorophores and hybridised to the probes. Like MLPA, this method will detect the relative abundance of each exon. However, because it also uses probes within introns, it allows pinpointing the location of the intronic breakpoint. 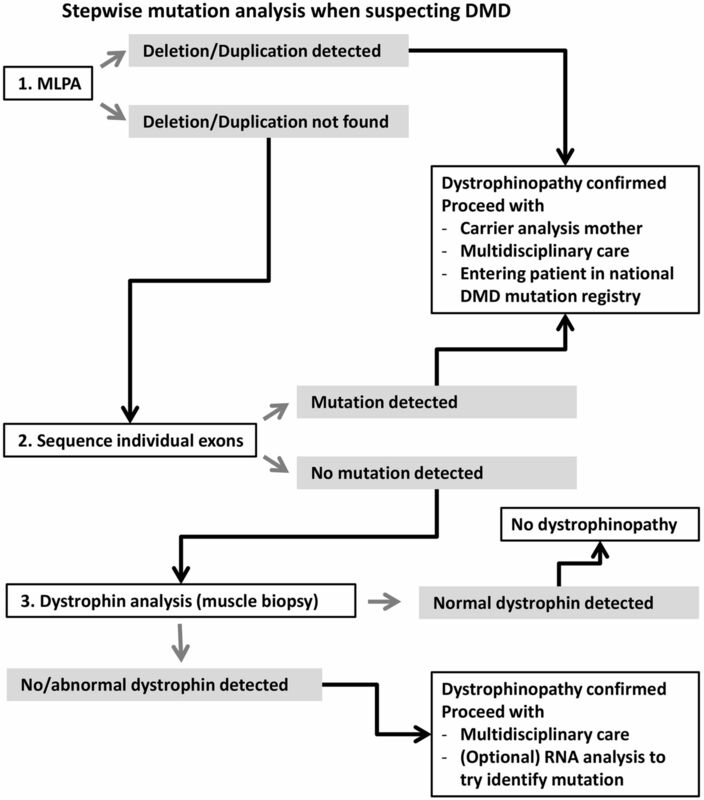 Multiplex PCR is not recommended for the genetic diagnosis of dystrophinopathy. However, it provides an alternative, cheaper approach to detecting deletions, and as such, is still used in numerous laboratories.37 ,38 This approach generally uses two primer sets to detect the presence or absence of exons 1, 3, 4, 6, 8, 12, 13, 17, 19, 43, 44, 45, 47, 48, 50, 51, 52 and 60. As such, it is able to pick up the majority of deletion mutations in patients with DMD and BMD. However, often the exact boundary of the mutation will be unknown. For example, when exon 45 is absent, this can be either an out-of-frame exon 45 deletion or an in-frame exon 45–46 deletion (because the presence of exon 46 is not assessed with this approach). This has ramifications for detecting whether a mutation is in-frame or out-of-frame, but also for assessing whether a patient is eligible for mutation-specific therapies like exon skipping. As such, the MLPA or array CGH are the recommended approaches to use first.33 In fact, historic cases identified with multiplex PCR in the past for whom the exact boundaries are not known should be reanalysed with MLPA because this can have implications for disease progression (in-frame vs out-of-frame mutations) and for eligibility for exon skipping therapy. If no whole-exon deletions or duplications are found using MLPA, it is still possible that the patient has a small mutation in one of the 79 exons (20% of patients have small mutations). These can be identified using Sanger sequencing of individual exons, which is labour intensive and more expensive than MLPA or array CGH. Protocols for MLPA and Sanger sequencing for the DMD gene can be found on the Eurogentest website (http://www.eurogentest.org). It should be noted that not all laboratories will follow-up with exon analysis when MLPA (or multiplex PCR analysis) are negative. A recent survey was conducted among 41 individuals (primarily (paediatric) neurologists and clinical geneticists from Europe, Turkey and India) working with patients with DMD and attending a TREAT-NMD DMD masterclass (funded by an educational grant from PTC therapeutics) (survey results are being prepared for publication on http://www.treat-nmd.eu). This revealed that all respondents were aware of the need for a genetic diagnosis. However, when deletion and duplication tests are negative, >10% of responders would not perform confirmative tests, while close to 90% would, using either exon sequencing or dystrophin analysis on a biopsy followed by exon sequencing. The main reason for not pursuing genetic analysis when deletion and duplication tests are negative was the costs involved in the Sanger sequencing or the lack of funding for shipping samples to laboratories able to conduct the small mutation analysis. It is possible that in the future MLPA, array CGH and Sanger sequencing will be replaced by next-generation sequencing techniques such as whole-exome sequencing for the genetic diagnosis of DMD. In fact, targeted sequencing of the DMD gene has already been reported using a library with probes covering the complete DMD gene to enrich for DMD and allowing a single-step diagnosis for deletions, duplications and small mutations in patients with DMD and BMD and carriers.39–41 However, currently it is more cost efficient to perform MLPA or array CGH followed by Sanger sequencing when no mutations are found. Obviously, there will be patients for whom no mutations are found. This can be because the mutation is located within an intron, as is the case for <0.5% of reported mutations, although these mutations may be under-represented because they are hard to detect. These mutations will be picked up with next-generation sequencing approaches, although without RNA analysis it may be challenging to assess whether intronic mutations lead to alterations on RNA level. Alternatively, the absence of a dystrophin mutation may indicate that the patient does not have DMD or BMD, but has a different form of muscular dystrophy. Historically, the first step in diagnosing DMD was often protein analysis on a muscle biopsy by immunohistochemistry and/or western blot analysis.42–44 These techniques can reveal the size (western blot), location (immunohistochemistry) and abundance (both) of dystrophin, but in a diagnostic setting are most frequently used to show the presence or absence of dystrophin. Some laboratories perform a biopsy when MLPA analysis does not reveal deletions or duplications to confirm a dystrophinopathy before embarking on laborious small mutation analysis. However, because a genetic diagnosis is still required when absence of dystrophin is shown in a muscle biopsy, and because a muscle biopsy is an invasive procedure, the standards of care for DMD diagnosis suggest bypassing a muscle biopsy and using only genetic testing to diagnose DMD (figure 3). For most patients, muscle biopsies are never required. 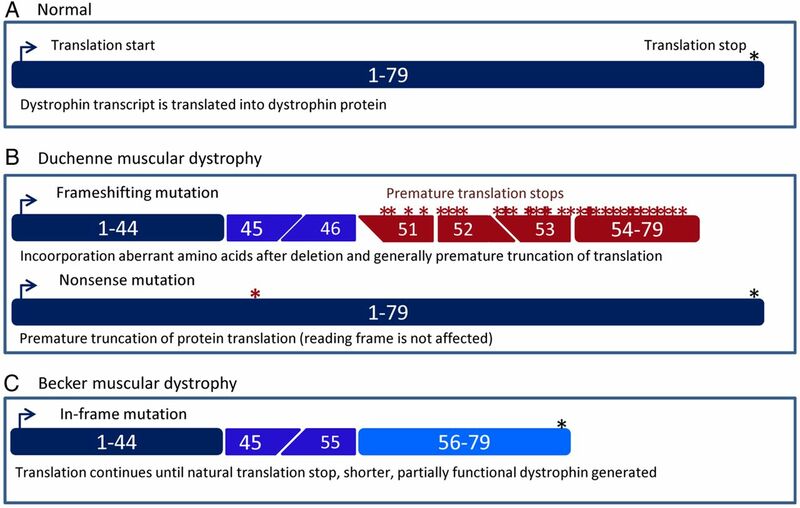 In exceptional cases, protein analysis can reveal whether dystrophin is absent in patients with a clear DMD phenotype but with no mutation in the DMD gene. If so, RNA can be isolated from the biopsied tissue and analysis may reveal an aberrant dystrophin mRNA transcript (eg, the inclusion of a cryptic exon due to a deep intronic mutation). Muscle biopsies may also be useful in patients who present with a discordant phenotype; for example, if a patient has an in-frame mutation but presents with DMD, a biopsy can reveal the absence of dystrophin. Vice versa, low levels of dystrophin detected in the muscle biopsy of a patient with an out-of-frame mutation presenting with a milder phenotype can explain this discrepancy. However, while dystrophin analysis may provide an explanation for why a disease course is slower or faster than expected, knowing this will not actually change the disease course. As such, this analysis is optional and not mandatory. DMD and BMD are both caused by mutations in the DMD gene. Having genetic confirmation of the mutation is important for patients because it has implications for disease prognosis, genetic counselling and evaluating each patient's eligibility for emerging genetic therapies. Given that the progressive muscle wasting is irreversible, it is important that patients are identified as early as possible to consider all potentially effective treatments early in the disease course. On average, patients are being diagnosed at age 4.1 years in an expert centre compared with 4.5 years in 2000.49 Raising awareness with family physicians and other healthcare professionals who see young children could improve this further. Finally, given that new genetic therapies are emerging, one could consider offering neonatal screening for DMD.
. Dystrophin analysis in clinical trials. J Neuromuscul Dis2014;1:41–53.
. Frameshift deletions of exons 3–7 and revertant fibers in Duchenne muscular dystrophy: mechanisms of dystrophin production. Am J Hum Genet 1995;56:158–66.
. Prolonged ambulation in Duchenne patients with a mutation amenable to exon 44 skipping. J Neuromuscul Dis 2015;1:91–4.
. Exploring the molecular basis for variability among patients with Becker muscular dystrophy: dystrophin gene and protein studies. Am J Hum Genet 1991;49:54–67.
. Diagnosis of Duchenne and Becker muscular dystrophies by polymerase chain reaction. A multicenter study. JAMA 1992;267:2609–15. Contributors AA-R and KB discussed the general outline of the manuscript. AA-R wrote the first draft of the manuscript and drafted the figures and tables and finalised the final version. IBG and KB provided comments and suggestions to the manuscript and discussed the outline of the figures. Competing interests AA-R declares being employed by LUMC, which has patents on exon skipping. As co-inventor of some of these patents, AA-R is entitled to a share of royalties. AAR is on the advisory board of ProQR and has been an ad hoc consultant for GLC consultancy, Global Guidepoint and PTC Therapeutics. Remuneration for these activities is paid to LUMC. KB declares having been or being on the advisory board of Acceleron, AVI Biopharma and Santhera Pharmaceuticals, being on the steering committee of BioMarin Nederland and being or having been a consultant for Debiopharm, Genzyme, GSK, Prosensa Therapeutics/BioMarin Pharmaceutical, PTC Therapeutics, Lilly Pharmaceuticals, Pfizer, Summit Corporation, Insight Research Group, Galapogos SASU, Shire Human Genetic Therapies Inc, Amsterdam Molecular Therapeutics, European Neuromuscular Centre, Bristol-Myers Squibb Company and Solid Ventures LLC. Data sharing statement The paper refers to a questionnaire done among neurologists and clinical geneticists. This work is currently prepared for online preparation. The results are shared here with the reviewers and the editor.